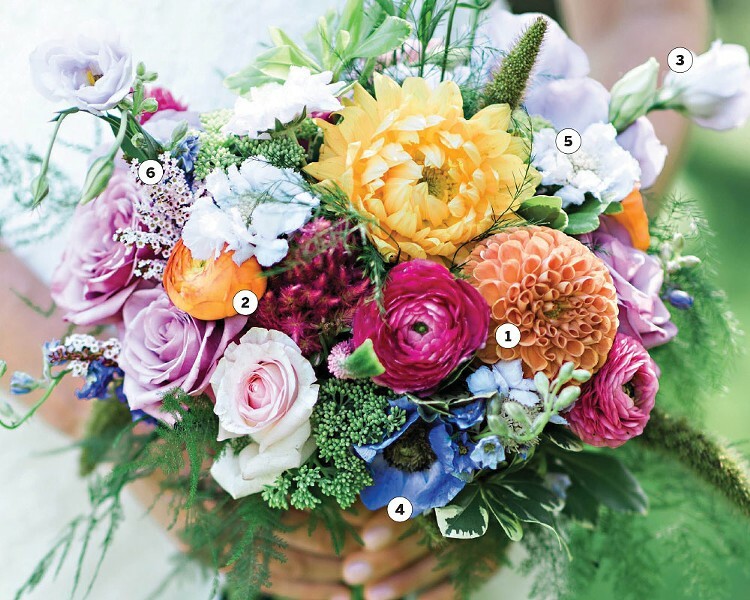 Breaking down all of the beautiful blooms used to make this bright, wild bouquet for a lucky summer bride, with The Flower Shop’s Charlotte Pierce. 1 Dahlias: This bouquet features two different varieties of dahlias as the focal point. They differ so much in texture and shape that we love putting them in almost every summer wedding bouquet. 2 Ranunculus: We used hot pink and orange ranunculus to brighten up this garden-style bouquet and to match the bride's fun personality and style. This bloom is popular in wedding floral design as it's formal, delicate and full of texture. 3 Lisianthus: We love using lisianthus in our garden bouquets because it frames them in a way that makes them not perfectly round, and a little wild. One stem provides open blooms and closed buds, which adds interest to a bouquet that should feel like it was just picked from the garden. 4 Anemones: Another focal flower that is delicate and impressive. This pop of blue tied the bride's bouquet to the bridesmaids' navy dresses. 5 Scabiosa: Latin for "itch," it may not seem like the most romantic flower to include in a wedding bouquet, but it worked so perfectly with the combination of other flowers. Similar to anemones, and just as special, this flower has a little more texture to it so it fit right in. 6 Greenery: Asparagus fern, grasses, and queen Anne's lace—lots of this lush, loose greenery framed the bouquet and added some drape to create a wild look. The Flower Shop is a downtown flower boutique that’s been creating artful arrangements for weddings and special occasions since 1936.